The ROUSH CleanTech propane autogas fuel system is a smart investment for your 2012 and newer Ford E-450 DRW dual rear wheel cutaway. This clean-burning vehicle lowers operating costs and emissions while providing superior performance. You’ll appreciate the zero loss in horsepower, torque and towing capacity of this vehicle, and see significant savings on fuel and maintenance costs. 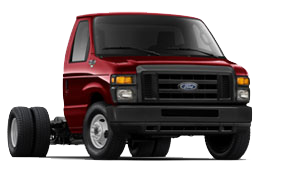 If you’ve bought a 2012 or newer Ford E-450 DRW cutaway van, you can convert your vehicle and begin saving immediately by installing a ROUSH CleanTech liquid propane fuel system in your 6.8-liter V10 configuration. These retrofit systems can be installed at any one of our conveniently located ROUSH CleanTech authorized installation centers. The 41-gallon propane tank of the Ford E-450 DRW cutaway, which replaces the aft of rear axle gasoline tank, gives you plenty of range between fueling. The fuel tank’s location also means conversion doesn’t affect Ford body specs, so any upfitter body applications can be installed without modification. For ordering information and price, please call 800.59.ROUSH or contact one of our authorized dealers. The Ford E-450 DRW cutaway van equipped with the ROUSH CleanTech propane fuel system provides the same great performance, horsepower, torque and towing capacity as the gasoline powered counterpart. In any altitude or extreme weather condition, you can depend on this fleet vehicle to provide reliability and performance. By incorporating propane autogas Ford E-450 DRW cutaway vans into your fleet, you will be helping America achieve energy independence because this alternative fuel source is domestically produced. Converting your fleet to propane autogas will also help your company to turn a greater profit by saving you on the bottom line costs of fuel and maintenance. You will increase customer loyalty because your customers will appreciate you providing them with a more environmentally responsible way to receive your products or services.